HostSG Review 2019: Is HostSG a Good Hosting? Singapore-based HostSG is one of the leading names in Singapore’s managed hosting market. The company delivers business and enterprise hosting services along with a range of web solutions to its global clients. HostSG is an ISO 9001:2008 certified company that was established in 1997. It is the first hosting company in Singapore with a Tier 1 network to Starhub, Singtel, Deutsche Telekom, Hurricane Electric, NTT Communication, and PCCW. In 2006, it was also the first company to support commercial server clustering for shared hosting. This company owns its own IP address and is a member of Regional Internet Registry (RIR) for the Asia-Pacific region. It supports 280,000 users that include multinational and Fortune 500 companies, Web 2.0 startups, SMEs, and advertising networks. HostSG’s core competency lies in providing fast international bandwidth, 100% network uptime, and outstanding customer support. Its website is in English. 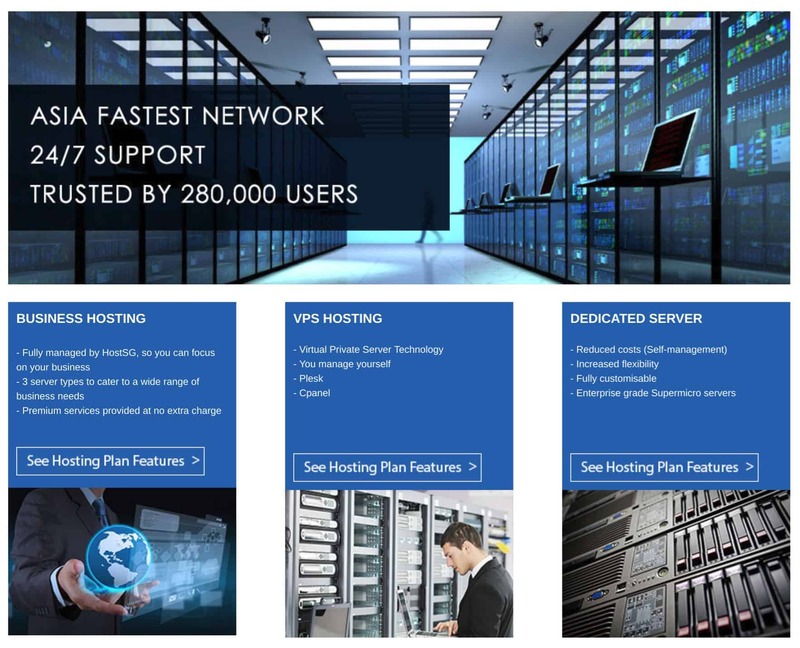 HostSG offers four starter hosting plans – named Starter 5, Starter20, Starter40, and Starter60 – with the names indicating the amounts of disk space (in GB) on offer. The company also offers Business Hosting plans (Linux, VPS, and cloud) and Enterprise Hosting plans (Linux, VPS, dedicated, and colocation). HostSG offers 99.5% server uptime, which is lower than the industry average, but the company makes every effort to provide 100% network uptime. HostSG’s hosting plans are complemented by a range of web solutions which include domain registration and transfer, email archiving and marketing, SSL certificates, and cloud email. 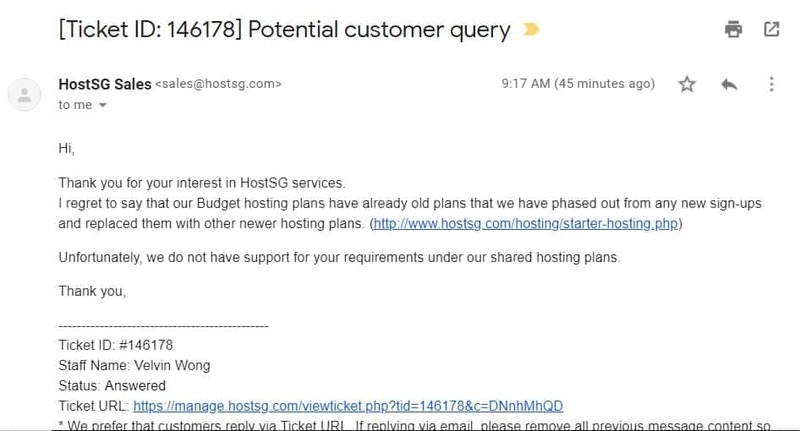 HostSG’s shared hosting plans can’t be called the cheapest, but they are affordably priced, and customers outside of Singapore can save the 7% GST (Goods and Services Tax). There are two billing cycles, annual and biennial, and you can pay for plans via cash/money order, local bank funds transfer, check, and credit cards (through PayPal). You get a 30-day money-back guarantee that should get you out if anything goes wrong within the first month, and you can upgrade your plan at any time just by paying the new plan’s pro-rated usage until the end of the month. However, to downgrade your plan, you have to pay a penalty (well, a “one-time administrative fee”) of S$20.00. When I tried the ticket system as a non-customer, I received a reply after twelve hours (see below), but current customers can log in to raise tickets that receive priority replies. For a company that caters to global clients, the lack of a real-time chat system and true 24/7 support were really disappointing for me. However, this is may be made up for by the self-help utilities that include FAQs (called “Pre Sales Questions”) and video tutorials (called “User Guides”). There is also a minimal knowledge base. HostSG’s hosting plans will be most suitable for you if your website’s target audience is in Singapore or somewhere else in Asia. Wondering how HostSG stacks up against other Web Hosting companies? Enter any other Web Hosting company and we will give you a side-by-side comparison.